Common beans are a staple food in many developing countries. However, changes in global precipitation patterns, particularly short droughts during the rainy season, have affected crop production because nodulation is greatly affected by water shortages. Plant growth-promoting bacteria, together with humic substances, can alleviate the negative effects of soil stresses, including drought. This work aimed to evaluate the effects of co-inoculations of rhizobia and Herbaspirillum seropedicae in the presence of humic acid-like substances isolated from vermicompost on the recovery of common beans after a controlled water stress. Two independent experiments were conducted in a greenhouse using Phaseolus vulgaris cv. Grafite and cv. Bonus, which originated in Brazil and Mozambique, respectively. The soil humidity was maintained at field capacity in pots, and the water suppression was induced at the pre-flowering stage. After 12 days, the water was restored, and the beans were evaluated. In the first experiment with ‘Grafite’ beans, the relative water content of the foliar disks was significantly higher in the co-inoculated treatment, as were the numbers and masses of nodules. The phenylalanine ammonia lyase activity was induced by drought, and its activity was higher in co-inoculated plant leaves. In the second experiment, the rate of net photosynthesis and stomatal conductance were also evaluated. 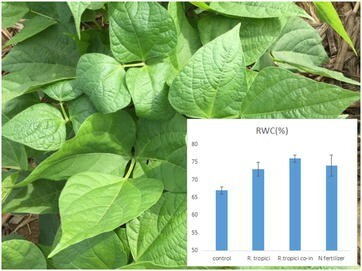 The recuperation of common beans after water stress was improved by co-inoculation with rhizobia and H. seropedicae in the presence of humic acid-like substances. The relative water content increased (RWC%) with co-inoculation. The common bean is a basic staple food that provides more than 70% of the dietary protein for poor people in Latin America and Eastern Africa . Biological nitrogen fixation (BNF) can reduce the use of fertilizers but the symbiosis with beans can be limited by environmental constrains, mainly water stress . A shortage of water compromises plant and rhizobial growth, and is a major cause of nodulation failure and low nitrogen (N2) fixation . Climate warming and changes in global precipitation patterns, particularly drought, are already affecting crop production . The rhizosphere and endophytic bacteria can promote plant growth through different mechanisms, such as biofertilization and biostimulation processes. The former involves the direct transfer of nutrients by BNF and increases the phosphorus (P) availability by mineral phosphate solubilization . Plant biostimulation is mainly caused by the production or modulation of several plant growth hormones, such as auxins, gibberellins, and cytokinins, and can promote changes in the plant’s under- and above-ground anatomy and physiology . In addition, bioinoculants can induce plant resistance to diseases and abiotic stresses . The bacterial production of hormone-like compounds plays a key role in the ameliorating effects of drought [8–11]. Decreases in drought stress-induced damage after the inoculation of different bacteria were observed [12, 13]. These effects were attributed to a reduction in the ethylene production by the bacterial enzyme aminocyclopropane-1-carboxylate deaminase and the maintenance of a normal level of plant endogenous abscisic acid . Some reports on mixed inoculations of rhizobia and Azospirillum on common beans showed enhanced levels of nodulation [15, 16] and higher crop yields [7, 17]. The use of a cell suspension of the endophytic diazotrophic bacteria Herbaspirillum seropedicae together with soluble humic substances resulted in the increased epiphytic and endophytic host-plant colonization by the bacteria . However, humic acid (HA)-like substances extracted from vermicompost increased the plant growth and water content of rice grown under water-deficient conditions . Stomatal closure and transpiration reduction, as responses to water deficiency, have been long recognized because the opening and closing of stomata results from turgor differences between guard cells and the surrounding subsidiary or epidermal cells . Like auxins, HA-like substances can also induce stomatal movement . Another important factor involved in turgor maintenance is the cell’s concentration of soluble compounds. Plants can enhance the expression of the phenylalanine (tyrosine) ammonia lyase (PAL/TAL; EC 4.3.1.5) and the total phenolic concentration of leaves in response to humic substances . Such metabolic changes are compatible with typical plant response to stress, including that caused by drought . Mixed inoculations containing a nodulation-inducing rhizobia and an endophytic plant growth-promoting bacteria have been relatively widely tested. However, the use of the mixed inoculation in combination with humic substances to enhance plant growth, and the evaluation of the biotechnological potential, under simulated water-stress conditions have been scarcely explored . Here, we performed two experiments to determine the potentialities of seed co-inoculations of common beans with rhizobia and H. seropedicae in the presence of HA-like substances to alleviate the impacts of a simulated water stress. The experiments were conducted in a greenhouse at Universidade Estadual do Norte Fluminense Darcy Ribeiro in Campos dos Goytacazes (Rio de Janeiro, Brazil) from October to December of 2012 (Experiment 1) and July to September of 2013 (Experiment 2) using, respectively, P. vulgaris cv. Grafite (Brazil) and P. vulgaris cv. Bonus (Mozambique). For both experiments, the pots were filled with a 0- to 20-cm soil layer from yellow Ultisol (21°45′S and 41°20′W) according to the soil survey taxonomy . Before being analyzed, soil samples were dried at room temperature and sieved (2 mm). The soil pH was determined in water (1:2.5; soil:water), after agitation for 1 h. Exchangeable calcium (Ca), magnesium (Mg), and aluminum (Al) were determined in the extract obtained with 1 mol L−1 KCl (1:10; soil/solution) after agitation for 10 min. The P and potassium (K) available contents were evaluated in the Mehlich-1 (0.05 mol L−1 HCl + 0.0125 mol L−1 H2SO4) extract (1:10; soil:solution) after agitation for 10 min. Al was determined by titration with 0.015 mol L−1 standardized NaOH, using bromothymol blue as the indicator. Concentrations of available Ca and Mg in extracts were determined in an atomic absorption spectrophotometer, K in a flame photometer, and P by colorimetry, using the molybdenum-blue method and ascorbic acid as the reducing agent. Soil carbon was determined by the oxidation of dichromate. The soil sample used as the substrate was considered strongly acidic, with a low cation-exchange capacity, low content of organic matter, and sandy loam texture, representing weathered acidic low fertility soil that covers large tropical areas of Brazil. The main chemical properties are shown in Table 1. The soil field capacity was estimated by a water retention curve, and the humidity at this point corresponded to 24% water in the soil. Sowing took place on October 10, 2012 (Experiment 1) and July 25, 2013 (Experiment 2). Three seeds were placed in plastic pots containing 9.0 kg of the soil sample from the surface layer. Thinning was performed 10 days after emergence (DAE), and 1 plant per pot was maintained. Harvesting took place 60 and 62 DAE for ‘Grafite’ and ‘Bonus,’ respectively. For both the experiments, the equivalent of 35 kg ha−1 of P (dibasic potassium phosphate), 25 kg ha−1 of K (as potassium chloride), and 20 kg ha−1 of N (as urea) were applied in furrows immediately before sowing. Liming with 2000 kg ha−1 of calcium carbonate was performed in each pot immediately before sowing. An additional 13.5 kg ha−1 of N (as urea) fertilizer was applied at 25 DAE. Two experiments were conducted in a completely randomized design with four treatments, non-inoculated plants as control, nitrogen fertilization treatment, single Rhizobium inoculations, and a mixed inoculation of nodulating and endophytic bacteria together with HA-like substances, and two levels of irrigation, continuous irrigation at field capacity and a water deficit induced at pre-flowering, in a 4 × 2 factorial arrangement with four replications per treatment. A mixture of Rhizobium tropici strains ‘BR322,’ ‘BR520,’ and ‘BR534’ obtained from the Embrapa Agrobiology collection (50 g of peat inoculant + 50 mL H2O for 10 kg seed) was used in the presence or absence of a mixture containing H. seropedicae strain ‘HRC54’ combined with HA-like substances isolated from vermicompost (1 mL per seed containing 108 cells mL−1 and HA-like substances at 135 mg L−1) as described elsewhere . The HA-like substances were extracted from vermicompost prepared using sugarcane filter cake and ground sugarcane from a commercial factory. The sugarcane juice was first cleaned with sulfur and then with Ca to promote colloid flocculation. The colorless cleaned juice was evaporated and then vacuum-filtered to separate it from the stacked solid remaining on the filter, which is called a filter cake. The filter cake was placed in a concrete cylinder (100-cm internal diameter) with a 150-L capacity, and the humidity was kept at 65–70% after mixing through weekly additions of water. Two cylinders (two replicates) were prepared per treatment. After approximately 1 month, earthworms (Eisenia foetida) were introduced at a ratio of 5 kg of worms per m3 of organic residue. At the end of the transformation process (4 months after the distribution of the last organic residues), the worms were removed by placing a pile of fresh organic residue in a corner of the container. The HA-like fractions were extracted from 10 g of vermicompost with 100 mL of a 0.1 M NaOH solution under a N2 atmosphere. This procedure was repeated several times until the supernatant became colorless. The extracts were united and centrifuged at 5000g for 15 min. The supernatant was then acidified with 6 M HCl to pH 2.0 and kept at 4 °C for 12 h. The precipitated HA-like substances were separated by centrifugation from the soluble fulvic acid that remained in the supernatant. The HA-like substances were purified by treating three times with 10 mL of a dilute hydrogen fluoride (0.3 M) + HCl (0.1 M) solution. After centrifugation at 4000g for 15 min, the sample was washed repeatedly with water, and dialyzed against deionized water using a 1 kDa cutoff membrane. After the dialysis process, the HA-like substances were titrated to pH 7.00 using 0.01 M KOH and lyophilized to maintain stability until used. The HA-like substances were characterized by determining their elemental composition and the presence of functional groups by cross-polarization magic-angle spinning (CPMAS) 13C nuclear magnetic resonance (13C-NMR) spectra. The HA-like substances’ elemental compositions were determined using a CHN Perkin Elmer autoanalyzer (Perkin Elmer series 2400, Norwalk, CT, USA). The oxygen (O) content was calculated by subtraction, O% = 100–C%–H%–N%, on an ash-free basis. The CPMAS 13C-NMR spectra were acquired from the solid samples with a Bruker Avance 500 MHz (Bruker, Karlsruhe, Germany), equipped with a 4-mm wide-bore MAS probe, operating at a 13C-resonating frequency of 75.47 MHz. The water pot supply was required to keep the moisture close to field capacity (24%) until the beginning of flowering, when the water-stress simulation began. The water-stress treatment was induced by withholding water until the moisture reached the permanent soil wilting point (13%), when irrigation was resupplied. The irrigated moisture was continuously maintained at field capacity. The soil humidity was continuously monitored using electronic devices (HidroFarm HFM2010, Falker, Porto Alegre, Brazil). In the first experiment with ‘Grafite,’ the permanent soil wilting point was obtained at 11 DAE. After rehydration, all of the treatments were conducted with an adequate water supply until the end of the experiment. In the first experiment, the root and shoot dry weights, and numbers and dry weights of nodules of ‘Grafite’ were evaluated. In both the experiments, the relative water content (RWC) from leaf disks was used to evaluate the plants’ water status . The analyses were performed on days 0 and 11 after the suspension of irrigation for ‘Grafite,’ and days 0 and 16 for ‘Bonus,’ and then again for both cultivars 2 days after rehydration (at noon). At the same time, the PAL activities were analyzed . For the second experiment with ‘Bonus,’ an additional sampling at 7:00 p.m. included the evaluation of the net photosynthesis rate (μmol m−2 s−1) and the stomatal conductance (mol m−2 s−1) using an LI-6200 automatic photosynthesis analyzer (LI-COR, Lincoln, NE, USA). All of the results were statistically analyzed using a two-way analysis of variance under a factorial design, and the means were compared using the least significant difference test at p < 0.05. The HA-like substances isolated from vermicompost showed low carbon (46%), and high N (5.7%) and O contents (45%). Figure 1 shows the main functional groups present in the HA-like substance as revealed by the 13C NMR spectrum, which shows broad signals near 30 ppm due to CH3 and CH2 groups originating from plant waxes and lipids, respectively. The peaks at 56 ppm (main peak) and 72 ppm were assigned to methoxy and O-alkyl groups, respectively, from cellulose, hemicellulose, and lignin structures. The broad resonance between 120 and 152 ppm represents aromatic and olefinic carbons, while the intense signal at 174 ppm reveals a large content of carboxyl groups, which is compatible with the high O content. The HA-like substances were mixed in a cell suspension of H. seropedicae and applied to common beans in two independent experiments to improve the water-stress recovery. The statistical analyses of the two experiments are shown in Table 2. In the first experiment with the common beans cv. Grafite, the rhizobial inoculation and co-inoculation (rhizobia + H. seropedicae) enhanced the shoot dry weights in the two water regimes (Table 3). Without the water stress, the enhancement rates were 18 and 56% greater than the control, for the rhizobial inoculation alone and for the co-inoculation with H. seropedicae, respectively, while under water-stress conditions, the shoot dry weights increased by 27 and 34%, respectively. The mixed inoculation under the water deficit showed a shoot biomass accumulation similar to that of the N-fertilized non-inoculated plants. The same qualitative results were observed in the second experiment with a common bean from Mozambique (cv. Bonus). The increases in the shoot dry biomasses were 34 and 38% without water stress, and 20 and 47% under water stress, in inoculated and co-inoculated plants, respectively (Table 3). The root dry weight was also significantly affected by the treatments. In the first experiment, root dry weights increased by 16 and 26% without water stress in inoculated and co-inoculated ‘Grafite’ plants, respectively, and 108 and 110% in inoculated and co-inoculated ‘Bonus’ plants, respectively, when compared with non-inoculated control plants. Under the water-deficit conditions, the promotion of root growth was enhanced with single and mixed inoculations, but the mixed inoculation’s enhancement was higher, being 64 and 174% greater than controls for ‘Grafite’ and ‘Bonus,’ respectively, while the single inoculation with rhizobia observed enhancements of 54 and 112% for ‘Grafite’ and ‘Bonus,’ respectively (Table 3). The net photosynthesis rate was measured only for the second experiment with cv Bonus, and it was higher in both single and mixed inoculated plants compared with the control in the two water regimes (Fig. 2a, b). The stomatal conductance was higher in the mixed inoculated plants under the continuous water supply at field capacity (Fig. 3a). When the water supply was interrupted, the stomatal conductance decreased and no differences were observed between the bacterial inoculation treatments. However, the values remained above those observed in control plants. Finally, we measure the PAL activity in the leaves. In both experiments, the PAL activities under water stress were higher than under control conditions (Table 6). No differences were observed between the single and mixed inoculation treatments during the greatest water-deficit period for both common bean cultivars. However, when irrigation was restored, the PAL activity was induced by the mixed inoculation in the ‘Grafite’ beans (Table 6). Here, we used, for the first time, applications of H. seropedicae, an endophytic bacteria, in combination with HA-like substances on the seeds of common beans inoculated with R. tropici strains as a biotechnological tool to improve plant water-stress recovery. H. seropedicae is a broad host range endophyte that colonizes sugarcane, rice, wheat, sorghum, and maize, and is used in biofertilizer formulations for non-leguminous crops . Part of the positive effects on plant growth and development could, hypothetically, be attributed to the alleviation of abiotic stresses, but limited studies have been designed to evaluate the potential of the bio-inoculation to reduce the negative impact of water stress. The mixed inoculation promoted the significant enhancement of shoot and root dry biomasses in plants not subjected to water stress, but the enhancement was more pronounced under water-stress conditions for both cultivars used (Table 3). Previous work using the co-inoculation of free-living plant growth-promoting bacteria (Azospirillum spp.) with rhizobia reported positive effects due to increased nodulation [7, 16, 31]. We did not observe any such effect of co-inoculation (rhizobia + Herbaspirillum) on nodulation (number or dry weight, Table 4) in both the independent experiments; therefore, the positive effects of the mixed inoculation on bean plants is not directly attributable to BNF. However, the effects of co-inoculation over the symbiotic performance of the plant with rhizobia cannot be ruled out completely since the nodule numbers and weights do not reflect viability. However, the results observed under water-stress conditions, the well-known effects of H. seropedicae on root grown and development [31–33], and the HA-like substances’ effects on the promotion of the root surface  support the data obtained in this study. The enhancement of the root growth is in keeping with the drought-resistant concept proposed by Lawlor , which includes delayed-stress onset. We monitored the water stress indirectly using an electronic soil humidity indicator in the pots and measured the RWC of leaves to indicate the plants’ water status. RWC is the water content (on a percentage basis) relative to the water content of the same tissue at full turgor (after floating on water to a “constant” weight). It has been criticized as an indicator, especially when the water deficit is not severe and/or when the weightings are not performed carefully . In the first experiment, a very significant difference in the RWC was observed in co-inoculated ‘Grafite’ beans between the water-stress and recovery periods (Table 4). For the ‘Bonus’ bean, the difference in the RWC was lower between irrigated and not irrigated treatments, indicating a dependence on the plant cultivar since the water-stress levels were quite similar, although it could depend on both the cultivar and stress intensity. Thus, we used the net relative photosynthesis rate and the stomatal conductance to evaluate the water status and performance of co-inoculated plants (Figs. 2, 3). Similar trends were observed using the biochemical indicator to monitor the stress effects. The PAL activity was higher in co-inoculation treatments in the first experiment during the stress and recovery periods, while in the second experiment, the PAL activity was higher in the co-inoculation treatment only during the recovery period. The second experiment corroborates a previous study in which the level of PAL decreased with mild to moderate water stress and recovered readily after re-watering . The problem of rainfall discontinuity during the rainy season has been occurring globally with an increased frequency, resulting in decreasing crop yields, significant food supply insecurities, and economic losses. This is especially important for bean producers that have low technology inputs. Here, we describe the greater recovery from water stress of common beans co-inoculated with rhizobia and H. seropedicae in the presence of HA-like substances using the simple indicators of plant biomass, RWC and PAL activity. We did not observe changes in nodulation, but the physiological and biochemical measurements of the host plant clearly indicate the potential of mixed inoculations using recommended Rhizobium strains and an endophytic bacterium (H. seropedicae) combined with humic substances for bean recovery after stress followed by re-irrigation. The proposed use of bioinoculant technology for beans could be an important tool to alleviate water stress and enhance food security in agricultural systems. This work is part of APM master thesis that conducted the experiments. LOM was responsible for the water-stress control; ATN and LBD contributed for the physiological and biochemistry measurements, respectively. LPC and FLO were responsible by the concept and wrote the manuscript. All authors read and approved the final manuscript. We are grateful to CNPq, FAPERJ, and INCT for Biological Nitrogen Fixation by financial support. A.P. Melo was a fellow from international scientific deal between CAPES, Brazil (PEC-PG program) and Scientific Minister from Mozambique.